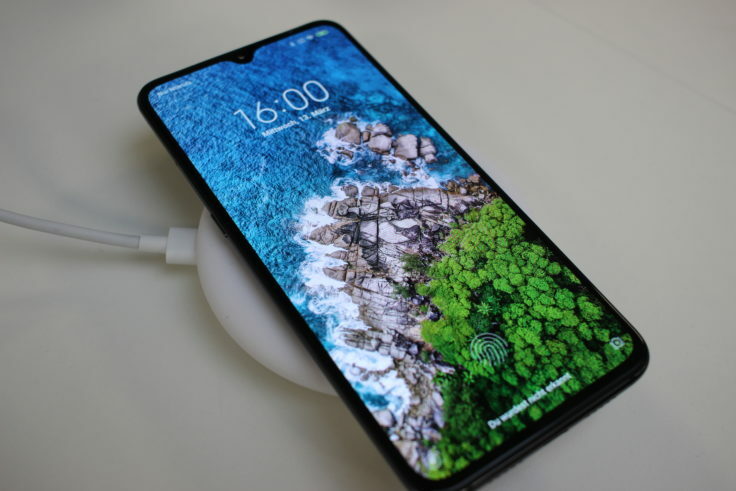 Even though the Xiaomi Mi 9 offers many interesting features, Xiaomi has conjured something out of the hat that no other manufacturer offers yet. Currently the world’s fastest wireless charger with 20 watts. 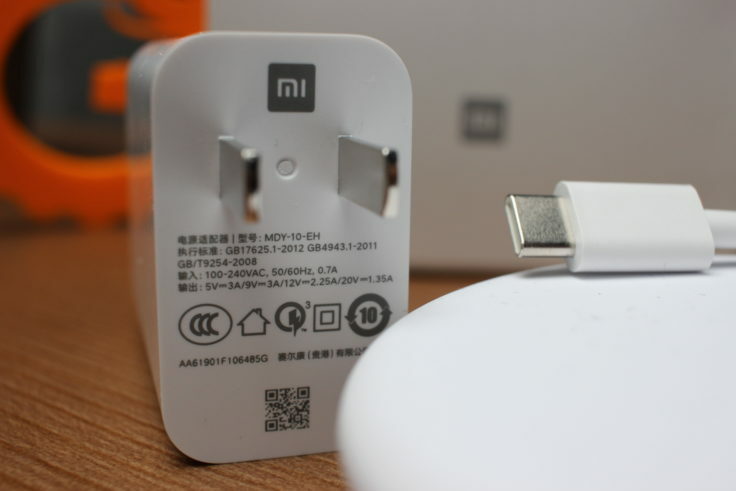 We have tested the matching Xiaomi 20W Qi charger and are a bit conflicted. The Qi standard describes a method of charging electronic devices wirelessly by induction. Many will have heard the term in another context: Qi (or Chi) means “breath” or “life force” in Chinese and plays a central role in various Asian religions. As will be explained further down in the review, it’s not just the 20W charge pad that counts, but also the right cable and USB charger. You are on the safe side if you buy the slightly more expensive bundle, which includes the 20W Qi charger, a 27W USB charger and the Xiaomi USB Type-C cable. So you are on the safe side and can charge your Mi 9 almost immediately without cables and at top speed! Finally the charger charges with 20V 1.35A, which is indispensable for 20W wireless charging. But not only that: with the 27W USB charger you can charge the Xiaomi Mi 9 in 60 minutes completely wired. Finally, the flagship supports the Quick Charge 4 standard! But there are still two disadvantages: There is no “Global Version” yet, so the charger is equipped with a China plug. So you need an adapter. In addition, there is no CE mark on the packaging & or the chargers, which can make the import more difficult. 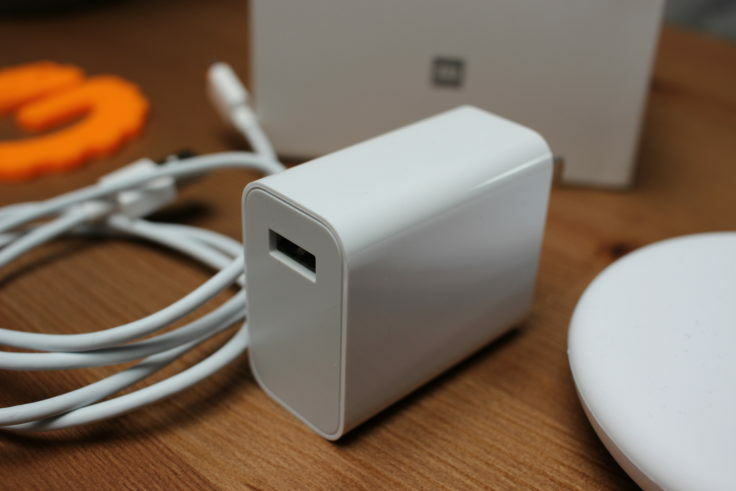 Xiaomi already sells a charger with up to 7.5W output power. 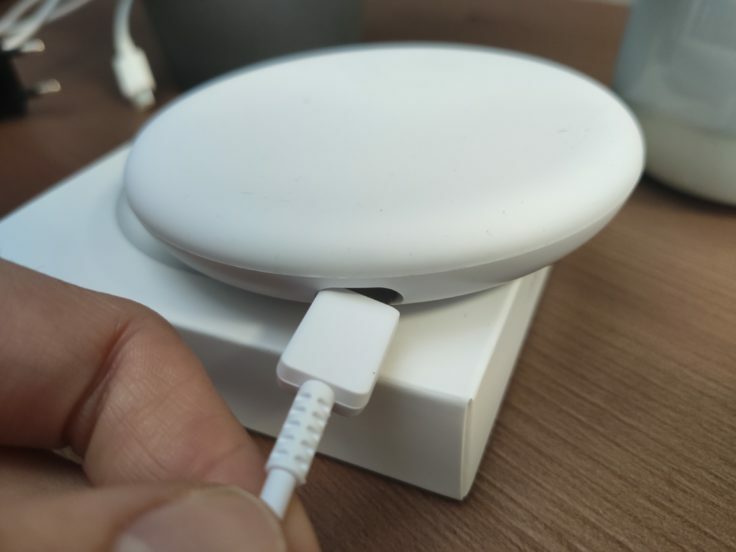 The new Charger looks exactly the same: A simple, white, circular plate with a USB type C connector. On the other hand, there is an LED that indicates the charging status. As with the cheaper model, the upper side is rubberized, which ensures a better grip of the smartphone on the upper side. This also works relatively well in practice, but you can easily move the smartphone if you want to. The same also applies to the underside. The charger makes a good visual impression right from the start, but this disappears after a short period of use. Because this surface literally attracts dust, which is not so easy to remove. The Xiaomi 20W Qi-Charger gets dusty quickly, a black surface would reduce this problem in my eyes. Maybe such a version will come. Unfortunately, the Qi charger is very susceptible to dust. 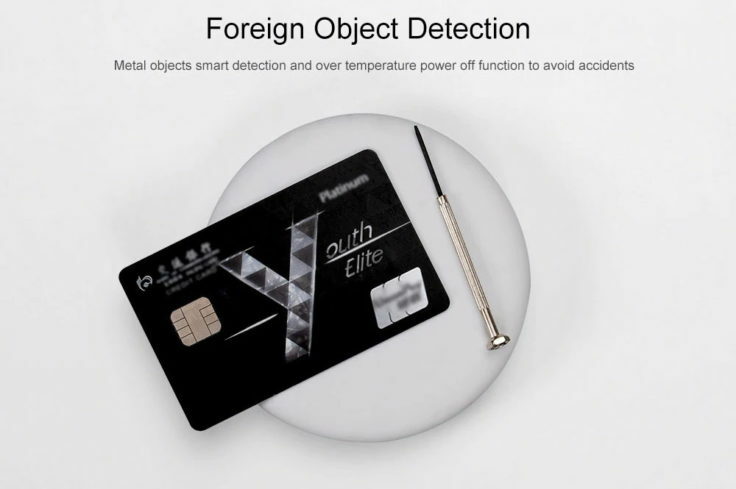 A glance at the underside reveals that Xiaomi has opted for a somewhat unusual design. 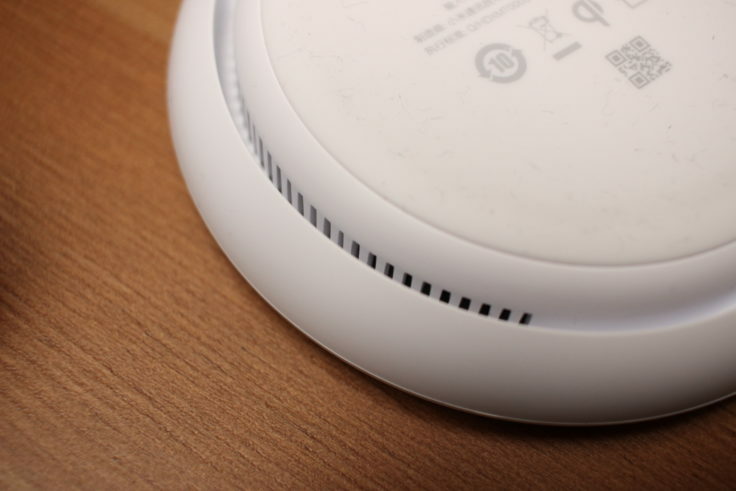 Since the charger’s performance is so high and the heat develops accordingly, Xiaomi has to install a cooling system. Therefore, the underside is divided into a base in which the technology including ventilation is located and a kind of outer ring that doesn’t rest on the floor. Fan slots are located on a good 60% of the side surface of the base, through which the warm air meets the outer ring and is then directed downwards or outwards. In order to keep the price low, plastic was chosen for this outer ring. This reduces the otherwise good overall impression of the workmanship somewhat, but in practice it makes no difference. Also, you don’t get the feeling that something could break because the outer ring is thick enough. But what really counts happens inside. The device supports up to 20W output and is supposed to charge the battery of the Xiaomi Mi 9 from 0 to 100% in 90 minutes. For example, we can use the normal Qi charger as a reference value, which charged the Xiaomi Mi Mix 2S with almost the same size battery in a good 2.5 hours. With 20W, Xiaomi is currently the worldwide market leader. The Huawei Mate 20 (X) can only be charged with 15W, Samsungs with 10W and iPhones with only 7.5W. The charger is downward compatible, so it can also charge older smartphones that support the Qi standard. And will it work? Yes, Xiaomi keeps his word. I was able to fully charge the Xiaomi Mi 9 from 0 to 100% in just 90 minutes with the 20W Qi charger! Very impressive and really a huge advantage in everyday life. If you only have half an hour to charge, you get the Mi 9 from 0 to 40%. What’s more interesting is that the heat development has been kept to a minimum thanks to the cooling. With 33°C it’s not much warmer, the difference is noticeable but not negative. The charging process with cable via Quick Charge 4 takes 60 minutes by the way. I also noticed that the charging station needs a short time to perform at its full capacity. The LED then flashes green quickly and it takes about 15 seconds before the smartphone can be charged wirelessly. Of course, this does not apply if the charging station is permanently attached to the charger. Of course, the ventilation mentioned also causes noise, which is not loud but audible. So if the device is lying on your bedside table, for example, you have to get used to a slight, permanent buzzing. Only possible with suitable accessories! However, Xiaomi can also manage one or two things that are annoying. First: the USB Type-C input. Not every cable is suitable for this input, as the slot is limited to a width of 1.2 cm by the outer ring. Of course you can use the USB-C cable included with the Xiaomi Mi 9, but some other cables lying around didn’t work. The original Xiaomi USB Type-C cable is also necessary for another reason! 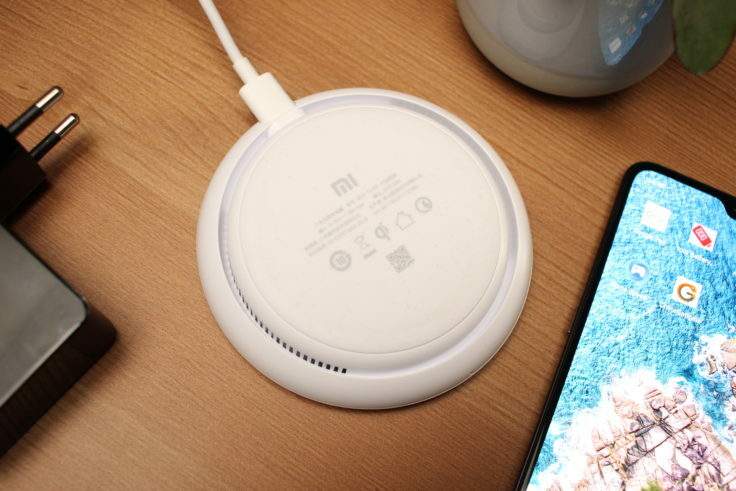 Not every cable and not every USB charger supports this fast wireless charger, you’ll be on the safe side when you order the bundle of Xiaomi 20W Base Station and 27W USB Charger. If you only order the Qi charger, you only get the charger, without any cables or USB charger. The 20W output power can only be achieved by 20V/1.35A, which results in 27W, but due to the energy loss during wireless charging we end up with the targeted 20W. Your charger has to support 20V voltage and at least 1.35A current – and not every charger does that. Quite smart: the Qi charger switches off automatically when a non-Qi-capable object is lying on top. Our combination in the test consisted of Xiaomi Mi 9, original Xiaomi USB Type-C cable and the Omars 45W Powerbank. So of course you need the 20W Qi charger, a 27W USB charger with support for 20V voltage and with 1.35 A and a USB-C cable, which supports exactly that as well. So in theory you can also use the Inateck 45W charger, but this didn’t work because we didn’t have a USB-C to USB-C cable with support for this voltage. As an alternative we could use the AUKEY USB-C cable. In addition to the 20Q Qi charger, Xiaomi has introduced further accessories for the release of the Xiaomi Mi 9. Beside the 20W car Qi charger there is also a 20W Qi Powerbank. The same principle is followed by the presented car charger. The only difference is that it is specially designed to be attached to the dashboard in the car. The charger is powered via the on-board power socket (commonly called a “cigarette lighter”). Strictly speaking, this is not only the charger, but also a complete holder. This is motorised and accesses automatically when it registers that a smartphone is being used. The price in China is 169 RMB, the equivalent of about $25. Last but not least, Xiaomi also introduced a new Powerbank. With it you can even charge your mobile phone wirelessly on the go, independent of external power sources. The battery capacity of 10,000 mAh is sufficient to fully charge the Mi 9’s battery more than twice. 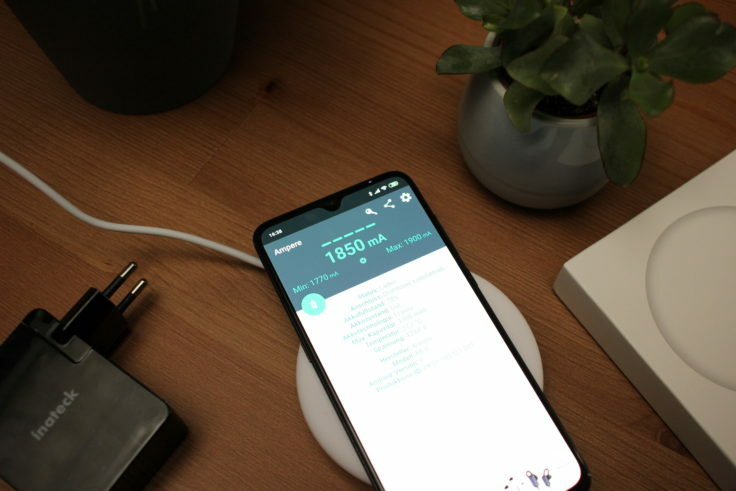 Due to the design, however, a large part of the energy is lost during wireless charging, so it remains to be seen to what extent Xiaomi has optimized this. Unlike the two Chargers, the Powerbank charges “only” with 10W, which is still very good for a mobile battery. The Powerbank costs 149 RMB (approx. $22). Nothing can be criticized about the function and the claim that it offers the fastest wireless charging in the world. It works, the Xiaomi Mi 9 charges completely in 90 minutes, which is a very remarkable value. But it’s a bit annoying that the necessary accessories for the Qi charger aren’t necessarily included and therefore only the bundle is recommended. Both the USB charger and the cable have to be compatible. Our setup with the Powerbank and the Qi charger only worked with the original Xiaomi cable and an AUKEY USB-C cable. We will collect more alternatives and add them to the article. So please feel free to write us in the comments with which chargers and charging cables you use the charging station. Hi, does anyone know a shop where I can get the Power Bank ?? ?